The gold – platinum breached unity recently for the first time in the past 30 months. 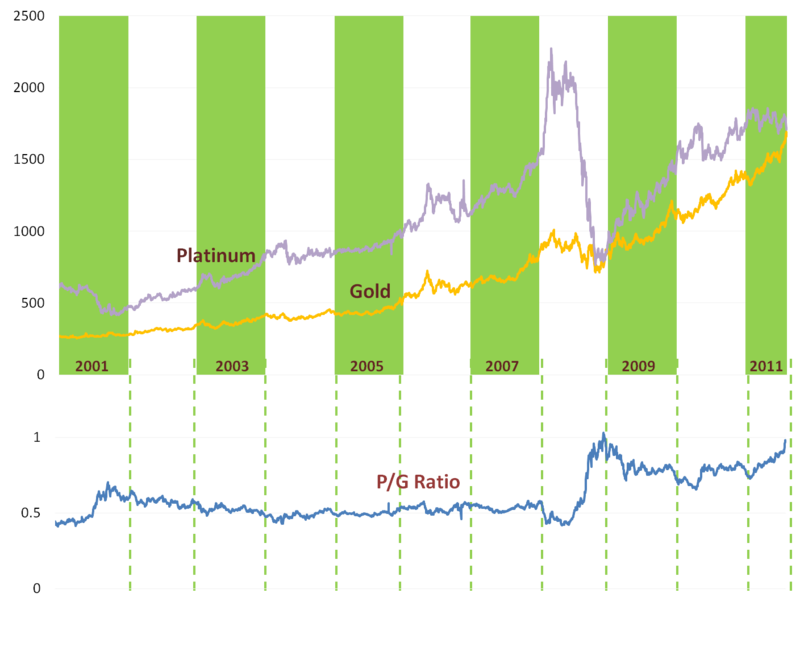 I have plotted the prices of gold, platinum and the gold/platinum ratio for the past 10 years. It does look like the 70s rally in gold may just get repeated this time as well. Last time we saw this convergence, the ratio quickly fell down and it was more a case of platinum retracing its sharp fall of 2008 and tearing away from gold. Gold rose as well but platinum rose faster. This time around, what will happen? Many folks are of the opinion that the ratio will shoot up as a result of gold continuing its upward march vis-a-vis platinum. It seems that platinum is a cyclical asset while gold is more seen as a heat sink, attracting the risk averse wielder of capital. Since industrial demand is down and many catalytic convertors seems to be idling around, platinum appears to have lost its sheen. Platinum has indeed been a 5 bagger during the first 8 years of the past decade, so a reversal to the mean (given its cyclicality) is expected. But the question to goldbugs is – will 1.0 the new near term median level for the gold-platinum ratio? Or will this p/g ratio retrace its recent climb and get down in the region of 0.5 which seems to be its last decade’s resting level. If the latter, then gold surely has ample room to rise.